When Marvin asks his mama why they have to stand and wait to take their food home while everyone else can eat at the lunch counter, her answer doesn’t make a lot of sense to him. “When some people look at us, all they see is our skin color.” Despite his fear of the man who told him his kind wasn’t allowed to sit at the lunch counter, Marvin knows that it’s up to him to make a change. Inspired by co-author James “Sparky” Rucker’s childhood, this significant story illuminates the tumultuous history of African Americans. 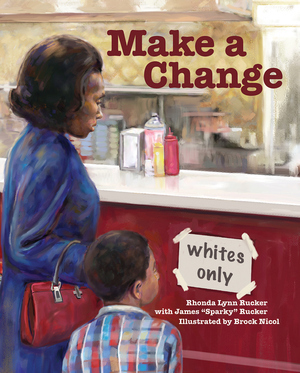 Powerful illustrations and a historical note from the author makes this picture book an excellent educational resource on past and current racial tensions. Full-time musician, author, and storyteller Rhonda Lynn Rucker received her bachelor's degree from the University of Louisville and her medical degree from the University of Kentucky. She and her husband, civil rights activist James “Sparky” Rucker, travel the country using music and stories to address environmental, social, and national concerns. 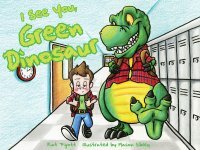 After graduating from the graphic design/illustration program at Algonquin College, Brock Nicol began his career as an illustrator. He was born and raised in Ottawa, Ontario, Canada, where he works at his home studio and where he lives with his wife, Anka.